Several complications can be related to surgical approaches of head and neck regions. 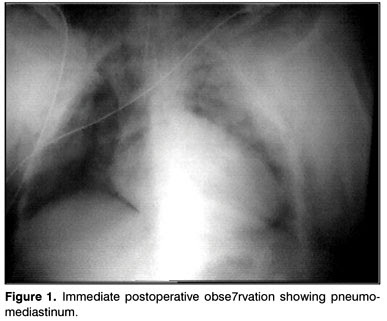 Among those, there are rare conditions such as pneumomediastinum, pneumothorax and subcutaneous cervical emphysema. This study reports a case of a patient that developed pneumomediastinum, pneumothorax and subcutaneous emphysema after undergoing tonsillectomy. In order to reduce these complications in surgical approaches such as tonsillectomy, care should be taken with intubation, use of oxygen mask for positive pressure ventilation during anesthesia recovery, aggressive surgical maneuvers and use of surgical instruments that may cause deep tonsillar injuries.